ALCOLOCK is committed to offering top-quality products that we develop ourselves. We aren’t satisfied with offering a single device or reselling an existing line of products. Instead, we are committed to immersing ourselves in the industry. Over the years, we’ve established a reputation for being experts in our field. We’ve stayed at the top of the industry by developing a wide range of high-quality products that span the entire gamut, from lab equipment to devices that aid program facilitators to the breathalyzers and products the consumer uses throughout their program. The High Purity Dry Gas Regulator is one of the quality products we offer to help make the road to license reinstatement and independence as easy as possible. The high purity gas regulator is part of our line of dry gas calibration equipment. The regulator ensures that the proper quantity of gas is released at the proper pressure. The regulator attaches to the gas standard cylinder. You can use the high purity gas regulator to ensure proper calibration when using our dry gas calibration products. When using the regulator, it’s important to follow all instructions so as to ensure the prolonged accuracy of your calibrations. Purchasing a stand-alone regulator is perfect for those seeking a replacement regulator. However, if this is your first time purchasing calibration equipment, you might find that our dry gas kit is a better value as it comes with everything you need to get started. Using the High Purity Gas Regulator is an essential part of the dry gas calibration process. Our regulator offers many benefits to those using this particular calibration method. ALCOLOCK’s High Purity Dry Gas Regulator is just one of the many accessories and products we’ve developed to help you reach your goals. Whether you’re a driver looking for ways to more efficiently complete your program or a facilitator seeking to expand upon your existing line of product offerings to better serve your client base, we have many options that can help. Visit our shop to find even more outstanding products and services developed with you in mind. Helps you avoid depletion of gas supplies. 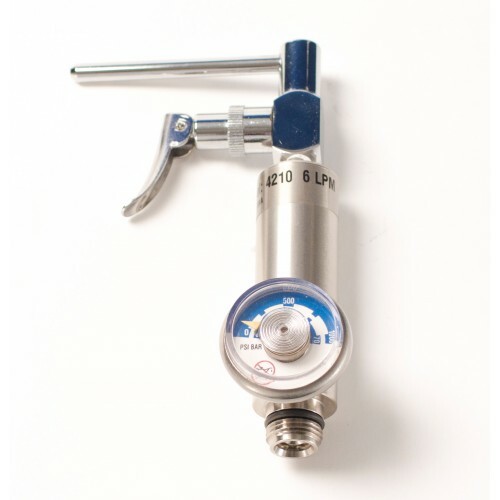 Trigger mechanism makes it easy to use and ensures proper gas flow. The trigger mechanism has a high quality chrome finish while the rest of the regulator is made of stainless steel, making the high purity gas regulator wear resistant.